Zhou Donghou v. Huang Longshi, 1660 Cont. Honinbo Shuei v. Karigane Junichi, 1900-05-23 Cont. Kong Jie v. Cho U, 2004-03-22 Cont. Amashi is a type of whole-game, territory-oriented strategy. The aim of amashi is to outlast the opponent, to let him take good points, but to follow hard on his heels by taking profit. 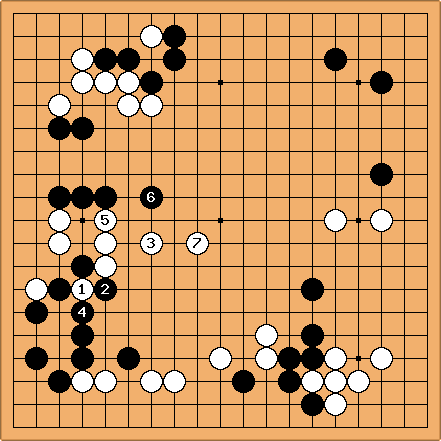 Shuwa refined amashi to a very high level as a strategy for White in no-komi games. The natural tendency with amashi is for the game to become a contest between Black's thickness and White's profit. That is, territory is taken in exchange for the opponent's influence or big points and influence is what is needed to attack. The amashi player hopes to weather the attacks and effects of the opponent's influence or numerous big points. Masters of amashi are thus, by way of necessity, also masters of shinogi. In an opening book, Ishida Yoshio describes another way of looking at it as: a strategy of negating influence or invading/reducing moyos -- not necessarily taking territory every chance you get, but taking away potential territory or making the opponent's stones inefficient by shinogi. This is supported by the Japanese definition of another term amashite utsu: "A high-level technique: while appearing to follow the opponent's orders and doing what is asked, to play in fact on the basis of precise calculation of relative positional gains so that the game will become favourable." The difficulty in amashi is three fold. First, the ability to dangle weak groups successfully as the game progresses -- leaving them just weak enough that the opponent can, and must, attack them, but ends up with no relative profit or no relative loss. Second, the ability to precisely calculate the value of an attack and its overall balance with the rest of the board. Third, the mastery of amashi implies a cascading mastery of several other techniques, including shinogi, amashite utsu, amasu (to induce overplays) and invasion/reduction. This strategy can be seen as the opposite of a strategy which builds influence to attack or build a moyo (inviting an invasion to then attack). Appreciating Famous Games, glossary: a high-level strategy in which over the board as a whole one permits the opponent to attack one and thus seemingly take the initiative, while planning to catch him unawares when he over-extends himself. Go Players Almanac: Letting the other player do what he wants, typically by letting one's weak stones be attacked, but coming out ahead, anyway. Literally, "having something left over", i. e., having enough territory left over to win the game. Black has left a group dangling next to White's influence and White now tries to aggressively attack it. 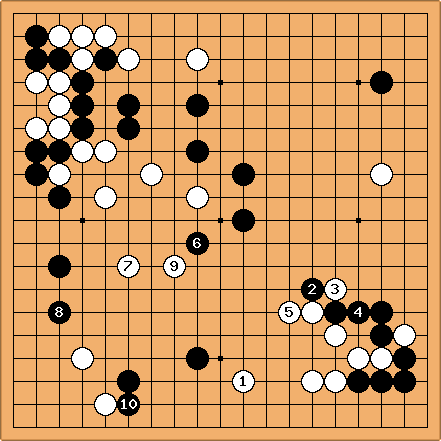 However, White's attack was too vigorous, and so Black is able to shinogi and leave White in a state of amarigatachi. 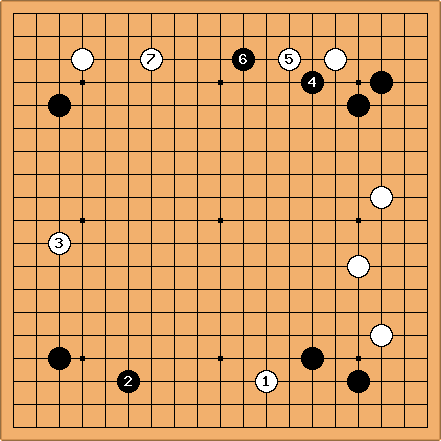 Black is further able to exploit White's shape later in the game. White , & indicate Shuwa's intention to follow an amashi strategy. Bill: This example comes from a game between Shuwa (White) and Nakagawa Junsetsu, in Kenrui Shuwa (Shuwa, the Fortress) by Fukui Masaaki, p. 79. The single kikashi of , followed by the oba of , and then the tenuki to play another oba at are, says Fukui, "a model of amashi uchi". induces and challenges Black to attack White's two stones on the left. Beginning with a well-read sequence starting with Shuei performs some shinogi and Black ends overconcentrated & with little benefit. Black takes the corner and then initiates an amashi strategy. While White gets thickness on the right, his chances of using it to make a moyo at the top are preempted by & . White begins an elaborate amashi strategy, dangling two groups. Source: Invincible - The Games of Shusaku, p. 190. Source: John Fairbairn in /Discussion.